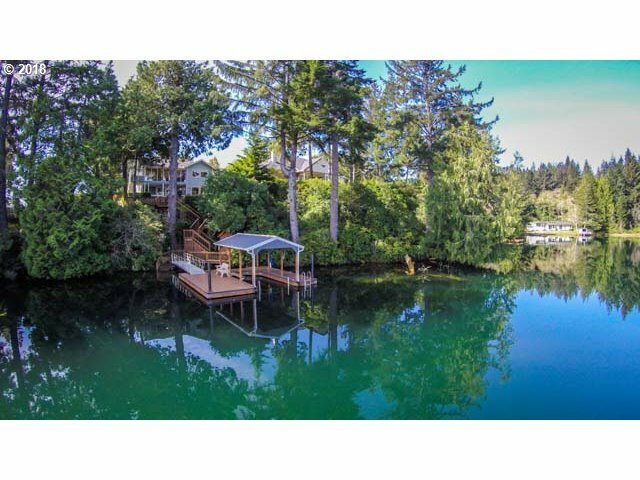 Exceptional Woahink lakefront home w/ private dock w/ lift & cover on wind protected cove and sand lake shore. Gated w/ new water treatment system and tank; gas fireplace with stacked stone.Solid granite counters, stainless appliances, walls of windows looking at lake. Both bathrooms have large tiled walk-in showers. Oversized 4 car garage w/ext. workshop, extensive lakeside decks w/firepit & BBQ. Has been a vacation rental since 2016.